Editing program for dictionary articles has new function for convertion romaji to hiragana, for example: "suru" → "する", "teki" → "てき" etc. To convert a text select it and press Ctrl+K keys or "あ" button. A bug was fixed that does not allow correctly select and translate Japanese text under the cursor in Internet Explorer at the end of paragraphs. A bug was fixed that does not allow correctly select a text with Ctrl+C keys in the input field. Jardic Pro 8.6 is available for download. 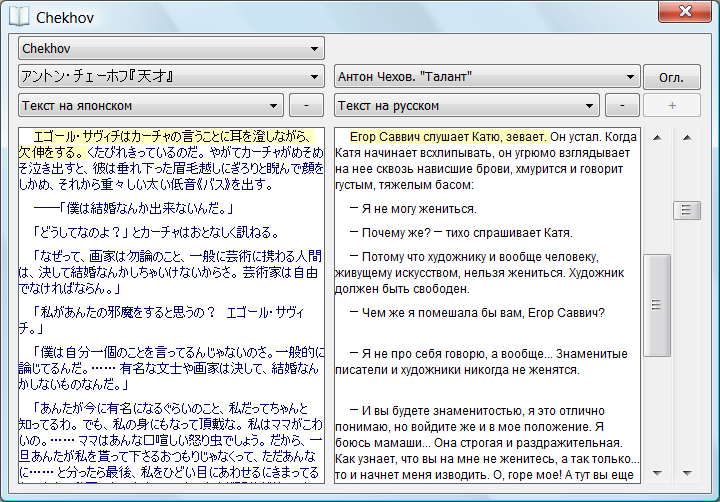 New version of the program can work with sample sentences from Tatoeba project. 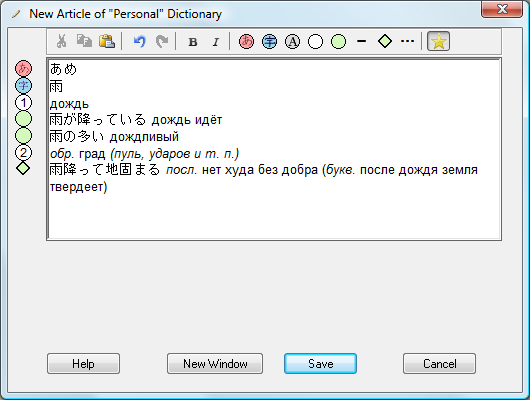 Dictionary file with Japanese-English-Russian Tatoeba sentence pairs can be downloaded like other dictionary files for Jardic Pro (described here). You can also download "Sentences" and "Links" files from Tatoeba download page and covert the files into dictionaries with statement pairs for other languages, for example for Chinese and Russian. Японско-русский медицинский словарь 18 ноября 2015 г.
Японско-русский медицинский словарь Василия Лободы "Medic", содержащий около 86 тыс. статей, с согласия автора выложен для общего доступа. Поиск в словаре можно выполнять в режиме онлайн (в списке словарей должен быть отмечен "Medic"), либо можно работать со словарем локально, предварительно загрузив его в Jardic Pro. Jardic Pro 8.4 is available for download. The program contains new features and fixes for found bugs. Jardic Pro 8.3.1 20 сентября 2014 г.
В новой версии Jardic Pro 8.3.1 добавлена возможность копирования словарных статей в текстовый процессор Word путем перетаскивания мышью соответствующих строк списка из окна Jardic Pro в окно Word. Jardic Pro 8.3. Расширенный полнотекстовый поиск 1 августа 2014 г.
Если в качестве поискового слова ввести существительное или прилагательное в именительном падеже, то программа покажет все словарные статьи, в которых это слово употреблено с различными падежными окончаниями. Например, при вводе слова "красный" также будут показаны словарные статьи, содержащие слова: "красного", "красных", "красном" и т.д. Эти же правила работают и при вводе нескольких поисковых слов. Так, при вводе поисковых слов "красная фасоль" будут найдены и словарные статьи со словами "красной фасоли" и т.д. Для поиска по точному совпадению слова (для отказа от расширенного поиска) поисковое слово необходимо заключить в кавычки. Описанные расширенные алгоритмы полнотекстового поиска используются и в онлайн-словаре, доступном со страниц нашего сайта. New Jardic Pro 8.2.1 contains fixes for a bug: a program did not use selected fonts after restart. Some users reported about incorrectly displayed kana or kanji characters: they see empty boxes instead of kana or kanji. It cold happen due to an error in Windows 7 - 8.1. The eror can be fixed with following trick: create a file or folder on a desktop with a name that contains kanji characters, like "火.txt" and restart the computer. The error is described in many articles, e.g. here. Collection of Anton Chekhov's works translated by Kiyoshi Jinzai is added to the list of dictionaries and books available for download in Jardic Pro. The collection contains Japanese-Russian texts of 24 plays and stories: "Uncle Vanya", "The Cherry Orchard", "The Seagull", "Ionych", "The Duel", "Kashtanka", "The Lady with the Dog", " The Darling", "Anna on the Neck" and others. "Stories1" collection file is added to the list of dictionaries and books for download in Jardic Pro. This file contains a part of literature works from Masao Utiyama's collection of alligned translations. The file contains more then 20 aligned translations of works by Charles Dickens, Charles Perrault, Edgar Allan Poe, Scott Fitzgerald and other authors. "Stories" collection file is added to the list of dictionaries and books for download in Jardic Pro. This file contains a part of literature works from Masao Utiyama's collection of alligned translations. The file contains more then 20 aligned translations of works by Akutagawa Ryunosuke, Arthur Conan Doyle, Ambrose Bierce, Aesop and other authors. During next months we plan to add other texts from Masao Utiyama collection with more then 160 items. New Jardic Pro 8.1.1 contains bug fixes related to Book Viewer, list of dictionaries, dictionary editor, and few other issues. Improved data compression algorithm was implemented for book files. New version of Jardic Pro 8.0 is available for download. Now Jardic Pro includes Book Viewer that can display books with parallel text in multiple languages. You can download "Japanese Law" book file with The Constitution of Japan, Civil Code, Copyright Act and Companies Act. 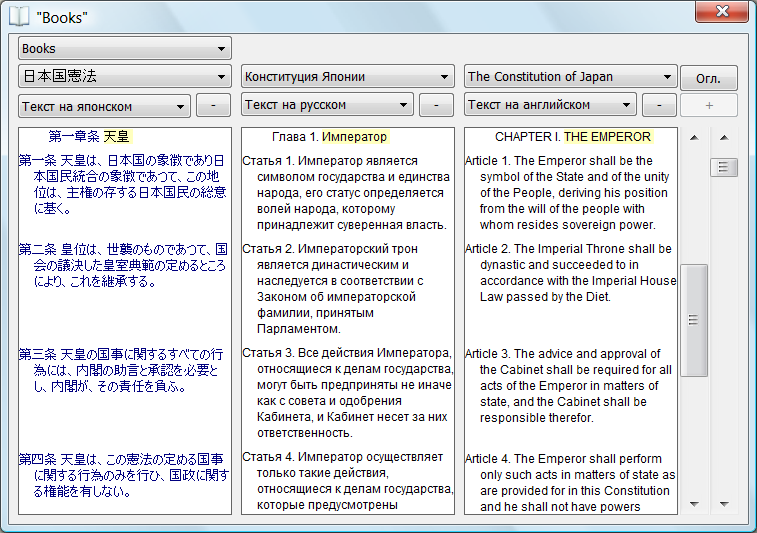 The text of The Constitution of Japan is in Japanese, English and Russian. Texts of other laws are in Japanese and English. Book Viewer supports on-the-fly word translation under the cursor. New version of Jardic Pro 7.2 is available for download. Now you can download additional dictionaries directly from Jardic Pro. 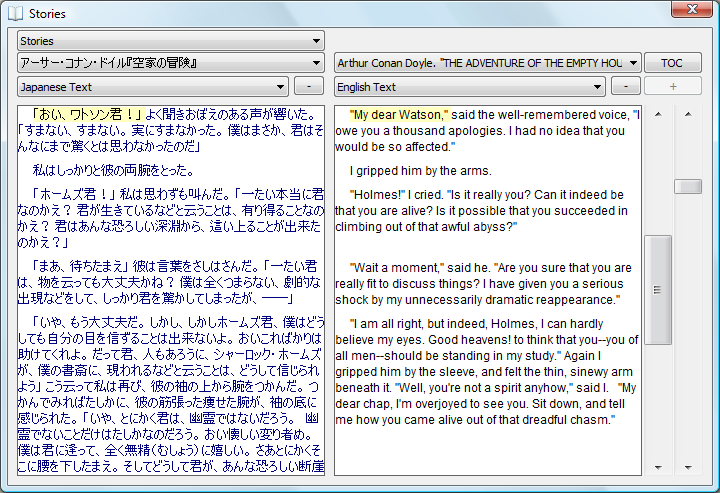 To download additional dictionaries press button of the main toolbar or select Dictionary → Dictionaries... menu command. 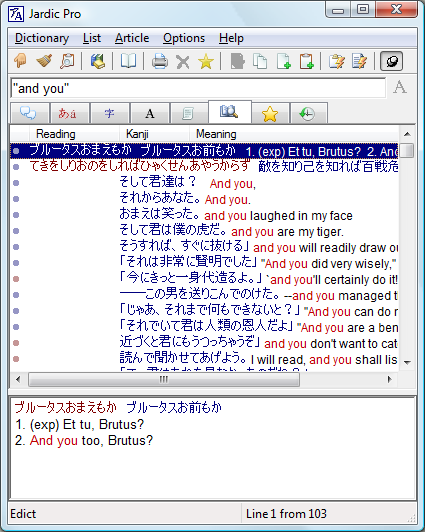 A window with the list of installed dictionaries will appear. In this window press button. A list of dictionaries awailable for download will appear. To download a dictionary or to update it select dictionary line in the list and press Install Dictionary button. "Print" function that sends a text to a printer or into a file now can send output to the clipboard. The function that translates words of the text and prepares a list of translated words now compares whether words are equal in katakana and hiragana writing. This is useful because Japanese texts often contain animal or plant names written in katakana, but related dictionary entries contain hiragana records. In the "Clipboard monitor mode" the program switches to the List of Translated Words every time you copy a word or text into the clipboard. Jardic Pro 7.1 is available for download. The program contains new features and fixes for found bugs. Program settings moved into one common dialog box. New parameters are added to specify behavior of the list of translated words. For example, the list of translated words can be partially expanded or collapsed; translation of Japanese words consisting of 1 kana character can be skipped; selected list items can remain the same between list switches, etc. Jardic Pro 7.0 is available for download. Now with abilities to create personal dictionaries and to edit personal dictionary articles. You can use personal dictionaries in the same way as other Jardic Pro dictionaries. Additionally you can add new articles, edit and copy articles of personal dictionaries. Any number of personal dictionaries can be created, but you can edit articles of only one personal dictionary at a time, that is called Working dictionary. During Jardic Pro installation the program creates an empty personal dictionary Personal.jdd. 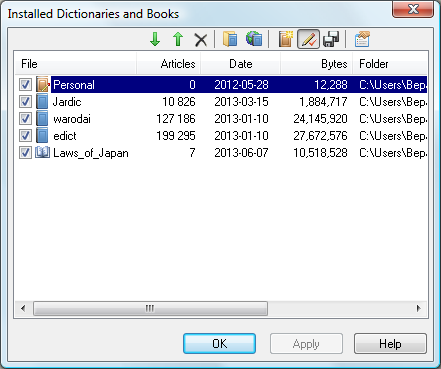 Dictionaries imported from Jardic Lite automatically become personal. To create new personal dictionary open Dictionary List and press button. To select a personal dictionary as Working dictionary highlight the line of the dictionary and press button. Articles of working dictionary can be edited using Editor Window. The text is divided into lines. Each line contain one article item (Reading, Sense, etc.). The text can be splitted into lines with Enter key. The sequence of lines is not predefined. It may be: Reading - Kanji - Sense, or: Kanji - Reading - Sense, etc. After pressing New Window button additional editor window appears with a copy of the text of the article from current window. New window text will be saved as separate dictionary article. Multiple additional editor windows can be opened simultaneously. You can use this feature to split one dictionary article into two or more articles. After pressing Save button the article is stored in the dictionary and a window closes. The program automatically adds edited articles to the list of Selected articles. With this list you can quickly find latest edited articles. Editor window is a non-modal window. It means that when the window is opened you can perform other functions including: word search, list scrolling, full-text search, edit other articles, an so on. Hebrew-Russian and Russian-Hebrew dictionaries by Anatoly Kaidalov are added to the list of Jardic Pro dictionaries available for download. We used these dictionaries to test correct work of Jardic Pro with languages that have right-to-left writing system. If you need Hebrew dictionary you can try these dictionaries too. Improvements in the graphic interface. The buttons and menu items now are commented with extended tooltips that make the work with the dictionary more easy. The language of program messages, captions and dialogs can be switched on-the-fly between Russian, English and Japanese on non-localized Windows. Names of dictionary files and printed files can be in Japanese. Some bugs were fixed. For example, previous versions of the program could not translate words under the cursor in Internet Explorer when zoom value was not equal to 100%. We continue active development of Jardic software in 2012. This year we are going to improve Jardic user interface, add the ability to work with phraseological dictionaries (e.g. a with dictionaries of proverbs or with parallel texts), add new functions to Jardic (e.g. an editor of articles in Jardic Pro). We are not planning migration of Jardic software to mobile devices in the nearest future. New Instant Search function was added. Improved support of Chinese, updated dictionaries. Selection of multiple articles for printing, deletion, etc.